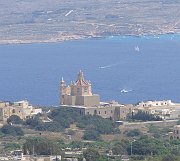 On the 22nd November 1899 Franciscan Minors (Ta' Giezu) came to Gozo to settle in a house called 'Ta Gliex' at Ghajnsielem. On 1st August 1901 Rev. Gwann Borg, Mr. Mike (Manweli), Mr. Ruggier and Marjanna Borg donated a piece of land so that the Friars could build their own convent. The first Franciscan Guardian was an Apostolic Missionary Leone Ferro. It was only two months after that Father Provincial Tonin Casel decided to construct a church near the convent. Mr. Joseph Sultana a businessman from Nadur donated the money for the erection of the church. In charge of the building was master builder Mr. Wigi Vella who was also responsible for the design of the church. On 7th September 1902 Bishop Giovanni Maria Camilleri blessed and laid the first stone of the new church dedicated to St Anthony of Padua. It took four years to finish work and on 28th October 1906 the church was blessed. Bishop Giovanni M. Camilleri then consecrated it on 4th November 1912.